Perhaps he is not a hero in the traditional sense, but he was certainly wrongly convicted, and very nearly hanged for a crime he did not commit, that of cold-blooded murder. The other man! There was something strange about him. He looked hunted and cowed, like a creature crushed and broken. He seemed to hang back as if he were afraid of the light of day. He appeared to draw no happy inspiration from God's sunshine. He fumbled at his overcoat pockets as if the very possession of a pocket was a new sensation. He trod gingerly, as if the earth concealed a pitfall . . .
Away they went by cab and rail to Newton Abbot. There the two men walked to the police-station, where the official announced that he was a warder from Portland Convict Prison in charge of John Lee, convict, on ticket-of-leave. John Lee handed his ticket to the police officer, who read it. What was it that made that policeman start as he read? What was it that made him look so curiously at the tall, thin, clean-shaven elderly man before him? It was this: Certain particulars on the ticket showed that on Feb. 4, 1885, the bearer was sentenced to death at Exeter Assizes for murder at Babbacombe. 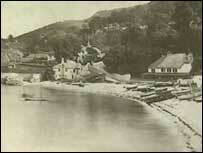 The man was "Babbacombe" Lee! "Babbacombe" Lee was on his way to spend Christmas with his aged mother John Lee, the man they could not hang, the man under whose feet the grim mechanism of the scaffold three times mysteriously failed in its appointed work. 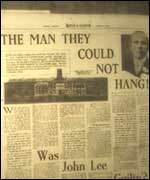 The story of his life's ordeal John Lee himself will tell. It is the story of one who, rightly or wrongly, was doomed in the flush of manhood to a torture more fiendish than the human mind, unaided by the Demon of Circumstance, could have devised. It is the story of a man dangled in the jaws of death, and hurried thence to a living tomb whose terrors make even death seem merciful. 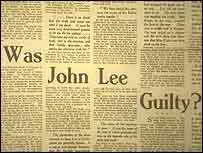 From this terrible ordeal John Lee emerges with the cry "I am innocent" still on his lips. And who that has suffered will not listen? 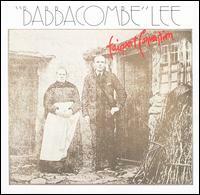 from the liner notes of "Babbacombe" Lee. Her pony's very old, it needs a nurse"
My father took them and tore them up, saying "That's no life for a boy of mine"
John, my son, don't join the Navy, don't go leaving your kith and kin"
Father put the pen to paper in the fields at lunch the very next day. Help me find my peace of mind, help me Lord, to sleep. And I'll send someone to meet you"
So I lay me down to sleep, I pray thee Lord my soul to keep"
attempted to burn the corpse." Though nowhere does it say exactly how or why he killed her"
So put that paper down before your breakfast goes quite rotten"
It is my solemn duty to arrest you on suspicion"
You'd do as well without me as I'm not allowed to use my voice"
May the joker hear your call and show you all more mercy"
"Courage, John, you're helpless and you are in heaven's hand"
Will you tell the world the story of John Lee? I was born to pay the hangman's fee. A voice in his ear says "They'll do you no harm"
There he whispers to me "Have you anything to say?" My mouth is dry, my throat is tight, I answer "Drop away"
"It's funny but it worked well, I tried it yesterday"
"Please, I'm tired of living and I really want to die"
"Lee, I'm truly sorry, forgive these hands of mine"